Corucia zebrata also known as the Prehensile Tailed Skink or Monkey Tailed Skink. The Prehensile Tailed Skink is the largest known species of skink in the world, measuring in at over 24+ inches, with many attaining sizes over 30 inches. The species is endemic to the rainforests of the Solomon Islands in the South Pacific and is often found high in the deep tree canopies. While once common in the pet trade, they have not been exported from the Solomon Islands since the early 1990's. This coupled with their low reproduction rate has made this species increasingly difficult to find in captivity and the few that are offered usually command high prices, in excess of $1000. This is one of the few species of reptile that thrive living in communal groups. Newborn skinks will also be raised within this circulus until they reach adulthood when they will go off to form their own family group. This skink is also one of the few in its species that is strictly herbivorous, often consuming the Pothos plant. Its tail is fully prehensile, often wrapping around branches or the handlers arm, to aid it in climbing. In captivity, this species requires a large arboreal style enclosure, 4'L x 2'W x 4'H usually recommended as the minimum size, with temperatures in the mid 80's, humidity at 70% and up, and plenty of climbing branches and foliage. My resident friendly wild water skink who's very very pregnant , having a feed on dead silkworm moths and disable mealworm beetles (heads squashed) and a couple of medium silkworms (that died overnight ( drowned when large silkworms started to make cocoons …. it happens ). 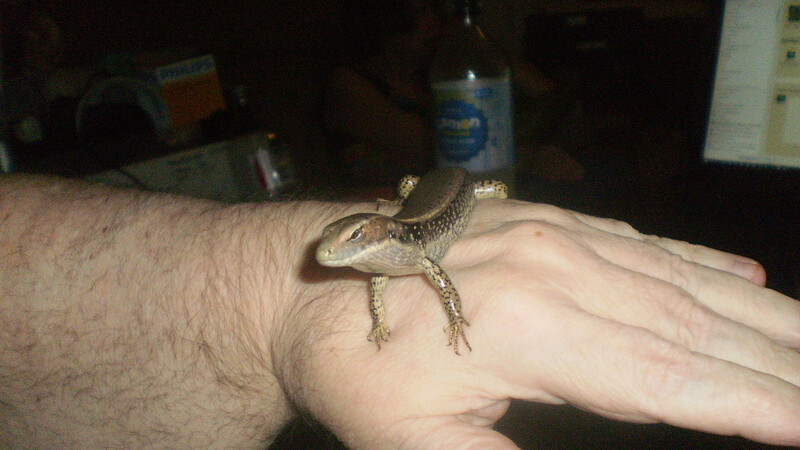 This is one of the skinks that often comes inside the house . This is the skink I've named Gutzy.